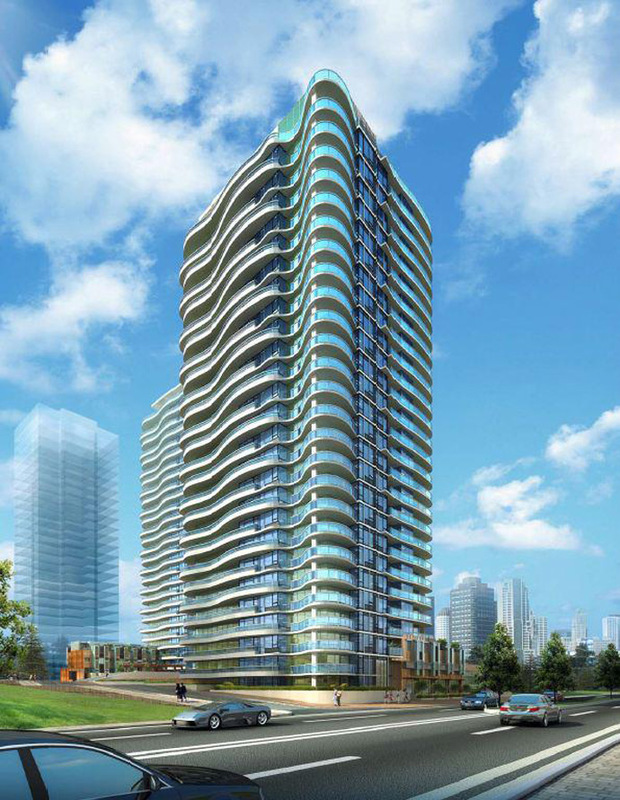 WAVE Surrey Condominiums > A NEW WAVE OF STYLE is now here at the inspiration landmark WAVE Surrey condo towers. As the City of Surrey’s slogan has been ‘The Future Lives Here’ … well, me must tend to agree (even though we are Vancouverites), that the new twin towers at the new Surrey WAVE Condominiums definitely pushes the limit in terms of design, architecture and brilliance. Brought to you by the collaboration of RIZE Alliance Properties and Mason Link Development, the beautiful wavy/curvy architectural design of the new Surrey WAVE Condos for sale is awe inspiring and will offer great curb appeal in this booming Surrey City Centre real estate locale. The futuristic vision of Surrey City Centre is now here with the addition of the preconstruction Surrey WAVE condominium towers that will present high-rise residences and ground level townhouses not ever seen in this neighbourhood. The first phase tower is 28 storeys in height and the architect for the new Surrey WAVE Condominiums high-rise is by IBI Group, an award winning firm. In addition, Mason Link Development and RIZE Alliance Properties have hired the False Creek Design Group as the interior designers for the preconstruction Surrey WAVE Condos in City Centre. The WAVE Surrey City Centre condo towers will present studios, 1, 2 and 3 bedroom residences from $179,900. The demo suite is being built at Central City Mall in Surrey as we speak and will be opening Spring 2012! REGISTER with us for PRE-VIP SALES Events for best selection of presale Surrey WAVE Condos and floor plans! LANDMARK SURREY CONDO LIVING in EVERY SENSE! When architecture is expressed as an art form and is combined with revolutionary interior design, the result can only be described as landmark. 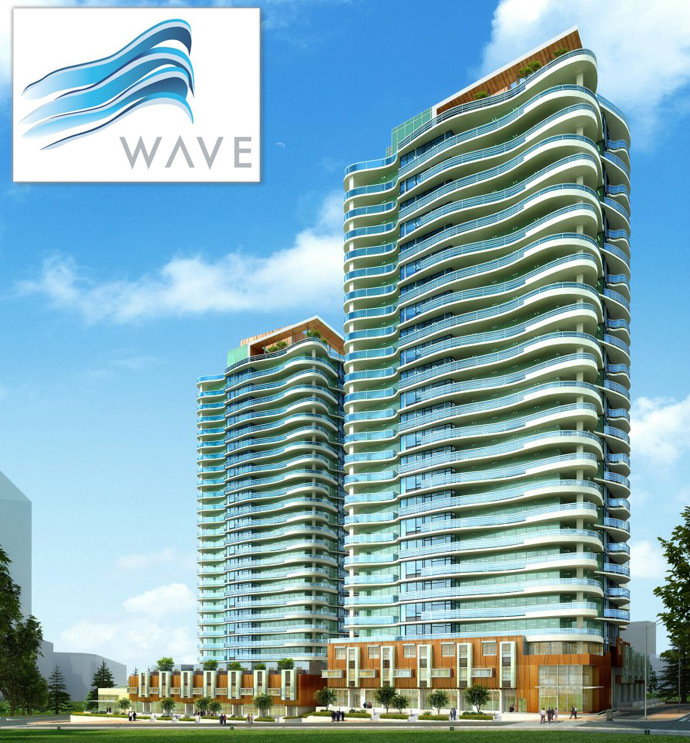 Wave Condos in Central Surrey real estate district is that such landmark. By incorporating expansive wrap around outdoor spaces, incredibly efficient floor plans and moveable interior walls that adapt to how you want to live, the new Central Surrey Wave condos for sale redefine contemporary urban living in Canada’s fastest growing region. Visit the Wave Surrey condo presentation centre today for more information and see why this is BC’s fastest selling condominium project. The future is now. The future is here. The future lives here. The future is at the luxury WAVE Surrey Condominium Towers. LiveatWave Surrey today by registering your interest above. Become a Surrey LiveatWave condo VIP and you can enter to win the Grand Prize Contest today. The winner of this contest at the WAVE Surrey Condos will receive a LiveatWave Surrey prize of approximately $60,000 value. The iconic landmark Surrey condo high-rises will be affordable as well as ideally located in this urban centre where home buyers will be within walking distance to all sorts of dining, restaurants, cafes, shopping, big box retailers, grocers and much more. Located at 104 Ave and 133 St Surrey City Centre, the new WAVE Condos for sale is an exceptional development project and will be very attractive to new home buyers, first time buyers, upsizers, retirees/downsizers as well as savvy investors in the Surrey City Centre real estate market looking for positive cash flow properties to invest in. The 2 towers will be 28 floors in height with a total floor area space of almost 410,000 square feet and a total of 471 market suites for sale. The starting price point of the new WAVE Surrey condo towers will be from $179,900, which is very affordable for today’s market as well as with today’s ultra low mortgage rates. The new Surrey WAVE Condos in City Centre will also be close to major bus routes and the SkyTrain Station in addition to the Surrey UBC Campus and great amenities. Both progressive and energetic, the new Surrey City Centre real estate district is full of excitement with new residential, commercial and retail space being built up very quickly. The urban developments are on a master scale compared to other Lower Mainland communities, and the addition of the landmark Surrey condo high-rises at the WAVE Condominiums will forever change the landscaped and skyline of this locale. All homes will have insuite laundry closet with washer and dryer in addition to spacious living rooms and many L or U shaped kitchens with full appliance sets. The new WAVE Surrey City Centre condos for sale will also introduce bathrooms with single vanities and tub/shower combos or just showers. Some floor plans have powder rooms. All new Surrey WAVE condos have outdoor living spaces. Many of the dens and extra bedrooms are separated by modern glass sliding doors to open up the living spaces. A completely unique development that has garnered recent attention is the new Central City Surrey WAVE condo towers which represent great architecture, high-end design and great affordability. Marketed as the world’s first real time, e-drama real estate campaign, the new WAVE Surrey Central City condo towers has just been unleashed at Surrey Central City Mall where you willl find a fully furnished, glass walled condo inside the mall which was designed and promoted by Pilothouse Real Estate Inc, a leading marketing consultancy company with a great track record in promoting Lower Mainland condo projects. There are actors living in the suite at the Surrey Central City Mall for the preconstruction Surrey WAVE condos for 45 days while being broadcast live on the internet! How fun is this going to be? A real-life Vancouver Big Brother! The presentation suite for WAVE Surrey Central City Mall features see through walls so mall patrons can watch the actions from the outside while mircorphones and cameras throughout the suite broadcast them over the internet. 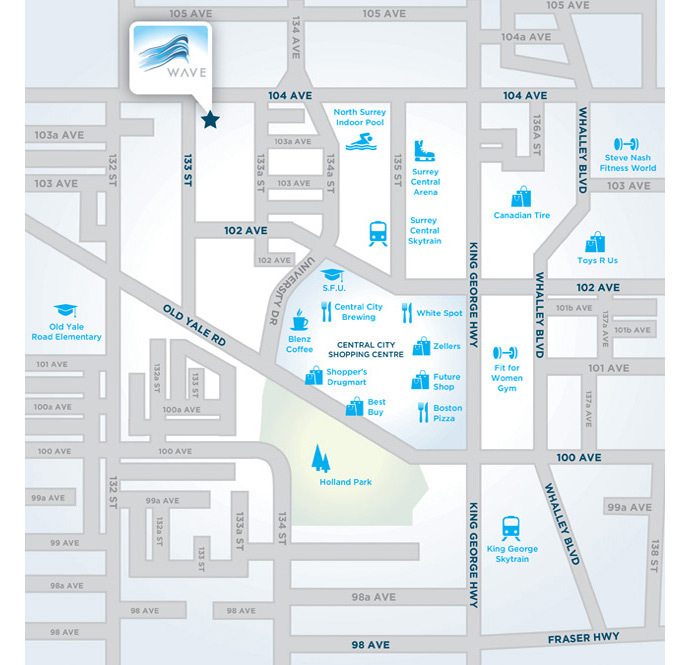 The campaign represents Rize Alliance’s new multi tower WAVE Surrey Central City condo tower development and is designed to demo just how simple it is to live in these well built, well designed and spacious homes in the heart of a walkable neighbourhood. In addition, the Central City Surrey WAVE condos will start from an amazing $179,900 and the sales centre is now opening. World class amenities and the new downtown will be home to the new Surrey Civic Centre project that will see the addition of a new community library, community plaza, Surrey City Hall, performing arts/cultural centre, boutique and big box retail stores, entertainment, fine and casual dining and lots of sidewalk cafes. The walkable neighbourhood where the new WAVE Surrey City Centre condo towers are being built will also be very close to the Surrey SFU campus in addition to all the facilities of beautiful Holland Park. The Surrey City Centre real estate district will be hope to almost 70,000 people by 2031 and currently has a population of 28,000 with an impressive work force near 18,000 already! The population of Surrey is the 12th largest in all of Canada, and only 2nd to Vancouver as the largest city in British Columbia. The Surrey City Centre real estate district is approximately 600 acres in size with another 45 acres of urban green space and parks, all easily accessible by preconstruction Surrey WAVE condo residents. The WAVE condos in Surrey by RIZE Alliance Properties and Mason Link Development will be situated at 135 St and 104 Ave Surrey City Centre and will be impressively close to Surrey Central SkyTrain and King George SkyTrain stations in addition to the Surrey Central arena, North Surrey indoor pool, SFU, Central City Brewing, Blenz Coffee, Shopper’s Drug Mart, Best Buy, Holland Park, Canadian Tire, Steve Nash Fitness World, Toys R Us, Fit for Women Gym, Future Shop, Boston Pizza, White Spot and the Old Yale Road Elementary School.